for the Bloggerette Sorority Sisters. and fill it with fall findings. This is the box I created for my partner Joy. it was fun putting together a gift for her. along with soft yellow roses, pumpkins and some bling. And the little witch wall hanging was fun to make. he he he! 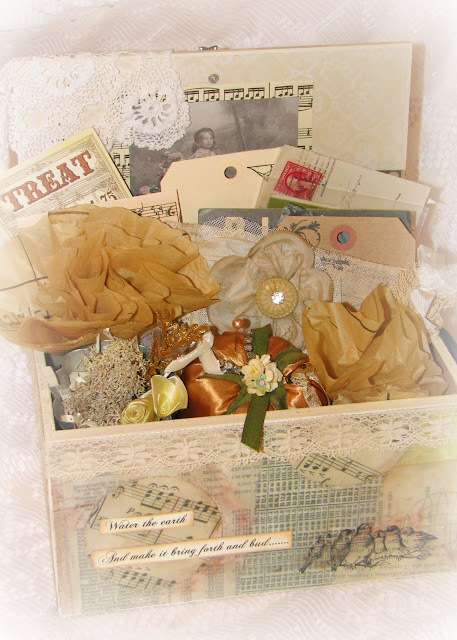 And, this is the beautiful box Joy created for me! There's been some serious swooning going on here! Did I mention I LOVE this box? And, this sweet image is on the inside of the lid. positively dreamy cuff she created for me. OMGosh! LOOK at this gold shoe pin!!! to look so pretty on my sewing table. I am so over-the-top thrilled with all these beautiful treasures! Thank you so much Joy!!! Oh, let's have one more peek at that beautiful box!!! To see more beautiful Fall Findings, visit Karen's blog. Yes, I would say you both had a beautifully successful swap...I am swooning over the pin cushion...my kind of colors!! what beautiful boxes you both created. Really gorgeous. How is the sewing room coming along? LOVED IT ALL! I am so glad you joined in! I know Joy will SWOON over your box just as well! Have a great weekend! Do you still have the white stuff or did it all melt? SIgh. Beautifully done Debi and Joy! I adore the tussie mussie. everything that joy created and assembled is SO you! i'm excited for you! and of course, what you sent to her is also absolutely lovely. you are workin' full time in that studio (and loving every minute of it, right?)! wishing you a safe & yummy halloween! Oh my goodness...both are so beautiful and filled with so many interesting, unique treasures. Perfection on both sides! Both boxes are beyond gorgeous! I participated too but I'm going to have to do a lot of practicing before I do so again. I'm not even in the same ballpark with you two! I had fun though! Wow! What a wonderful swap! Thanks for sharing all these lovely pics! Ladies you really know each other so well! Both of your boxes are just dreamy! You two are extremely talented and have created such outstanding boxes! Like my partner Cheri said, I too need more practice! Who wouldn't be over the moon after getting either of those boxes????? YOU AND JOY ARE LIKE TWINS. WHAT STUNNING JOBS YOU BOTH DID. THEY ARE TRULY STUNNING WORKS OF ART. I SAW THAT EIFFEL TOWER IN YOUR BLOG HEADING....THAT BONDED ME WITH YOU IMMEDIATELY. I LOVE PARIS...NEVER BEEN BUT I BEG AND PLEAD FOR ANYONE WHO GOES TO SEND ME A POSTCARD. I KNOW MY FRIEND DEEDEE AND I WOULD LOVE SPENDING TIME CREATING WITH YOU AND JOY. MY SWAP PARTNER, REBECCA, SENT ME A BEAUTIFUL PARISIAN ALTERED CIGAR BOX. THE PUMPKIN PIN CUSHION WAS STUNNING...THE MATERIAL SO SHIMMERY. I AM GOING TO SPEND TIME LOOKING THROUGH YOUR BLOG AND THEN VISIT JOY. Oh what a swap! You are both so lucky, creative and talented! Swooning over both boxes!!! OhMyGosh!!! What treasure troves....both boxes are absolutely to die for!! Love the touches of the season sprinkled in with all the fabulous glitz and softness. The shoe is fabulous! Wow, just lovely! Both the box that you gifted and the one you received are truly amazingly beautiful!! And all of the goodies inside each of them.....be still my heart!! Oh Debi..your photgraphy is just beautiful....so happy you took some good pics of the box I sent as I realized I hadn;t taken any pics of it after I sent it off to you ! Hope you saw my post about the box you sent me...love it! WOW, both boxes are just beautiful! LOVE LOVE LOVE the tussie mussie and the wrist cuff, just gorgeous!! I LOVE this swap!!! Just gorgeous!! I love that photo on the inside of your box. and I too am swooning over that little shoe pin-it does look like a Marie Antoinette shoe! I love Historical Fiction, and anything to do with it's characters! Both of the boxes were just beautiful. You two do have much in common. This has been a fun swap.